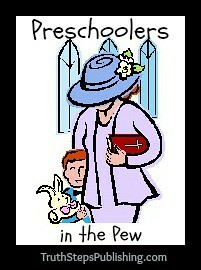 I've had several inquiries on how to handle preschoolers in the pew. This can be a challenge indeed! I have several ideas that can help. You probably won't like my first tip, but it's true and it works! Yep. Just wait. They won't stay preschoolers forever. They will slowly mature and their attention span increase. They will grow up before you know it! 2) Preschoolers certainly aren't too young to pick up on the tone of the service. 3) Consider the learning (listening) style or "best behavior" of your child. For instance, "best behavior" for my son was to have something in his hand that he could manipulate. A small wad of silly putty or a small car were each something he would quietly play with for long periods of time. In fact, I've learned that my son listens far more attentively in all sorts of situations if his hands are kept busy. One of my daughters could sit and doodle or color quietly for long periods of time. I've even dished out non-messy, quiet snacks (like Cheerios). Just be sure to not leave leftovers for others to clean up. Teach your children to be respectful of both the property and the cleaning crew. I realize that some of these things could be a nightmare for some kids. The silly putty would be in the senior lady's hair in front of you, the Matchbox car would be swerving in and out of all the Sunday shoes down the row, or a Cheerio flicking contest would be in full swing. Find what will work for your child. I'm not talking a wagon load of toys. I'm meaning to allow your really young one to do something that allows him to easily sit quietly for the longest amount of time. Find something that works for your child. And then, let him fall asleep if he desires! If you just can't find anything that will work for your preschooler, then tip #4 will need to become your bigger focus. 4) Training a preschooler in the pew really begins at home. Do you have family devotions? This is the perfect time to begin requiring your little ones to sit quietly in their space and do their best to listen and participate. If not, does your child eat meals at the table? Of course! So this takes care of 2 things in 1 (table etiquette and training for the pew). Even for a preschooler, meal time is not play time. It's time to enjoy the company of the family but not time to be crazy loud or wiggly up and down. Teaching and expecting appropriate table manners and to remain respectful and in his seat, is great training for a preschooler in the pew. up, and no talking. They were free to either look through the books or do nothing. The purpose was to begin teaching them boundaries and self-control. I didn't realize it at the time but I believe this daily practice did much to prepare them for the pew (and other times that they were required to sit still and quietly). I know that some of you will disagree with allowing your child any type of manipulative or find it difficult to put up with the wiggles. But hear me out and don't forget that I'm referring here to preschoolers only (or older children with special needs). At the preschool age, I think the most important reason for being in the service next to mom and/or dad is to begin to absorb the tone of respect and joy of worship. I think it is a rare preschooler that will pick up on those attitudes if he is forced to sit up, sit straight, sit back, sit still, stay awake! They are, after all, preschoolers. Just yesterday they were babies! So keep your expectations realistic. It will keep you from becoming frustrated and your child from becoming miserable and dreading church. Before you know it, your child will be learning to read and write and can begin to use Sermon Notes for Kids! And for a regular does of tips on training our children to worship, follow us on Facebook!